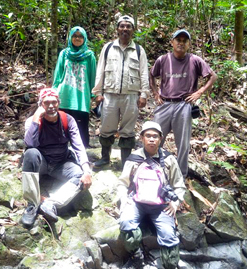 BANGI, 2 December 2014 – The upsurge in demand for traditional remedies using various plants found in the Berembun Forest Reserve in Negeri Sembilan has prompted a researcher from The National University of Malaysia (UKM) to call for its preservation and protection. The postgraduate researcher at UKM’s Institute of Environment and Development (LESTARI), Faten Naseha Tuan Hussain said the demand for traditional remedies as well as pharmaceuticals is increasing. She is currently doing Masters to study the economic valuation of medicinal plants in Berembun Forest Reserve under the supervision of Dato’ Shaharuddin Mohamad Ismail and Prof. Emeritus Chamhuri Siwar of LESTARI. The forest plants are not only used for traditional medicines but are also increasingly used for the production of pharmaceutical drugs. With the Berembun Forest Reserve being a rich source for such medicinal plants and is also easily accessible for anyone to enter and remove the plants, it is constantly under threat. Faten Naseha had chosen the Berembun Forest Reserve for her studies because it is classified as Virgin Forest under the custody of the State Forestry Department. She presented her findings at the 2014 LESTARI Graduates Colloquium here late last month. She said the World Health Organisation (WHO) estimated that as much as 80% of the world’s population depend on traditional medicine for their health care. Because of that sales of traditional medicine internationally is growing by 10% a year thus the high demand for the plants. This is compounded by demands from the pharmaceutical industry for the production of modern drugs. Malaysia, she said, have the opportunity to cash in on both the local and international demands by controlled harvesting of such plants. Faten Naseha found some 873 plants made up of 86 species, 71 genus and 47 families had been recorded in the forest reserve. Among the species found are Anguifera Rhinorrhea, Barringtonia Macrostachya, and Strychnos Ignatia. She also expressed concern over the threats to the forest resources which needed serious measures to be taken to protect and preserve them.